Last year, our neighbour Nettie gave us a huge bag of Quince. I don’t know if you’ve ever had Quince? You can’t eat them raw – they will rip the inside of your mouth out with sourness. They look a bit like apples – big, yellow, lumpy apples – and they smell sweet and almost clove-y as they ripen. Bring the wine, sugar, cloves, zest and cinnamon to the boil in a medium saucepan and simmer until reduced to 2 cups of syrup. Add the quince slices, cover and cook over a medium heat until tender [this will take about 2 hours, quinces are tough old things], don’t stir it – you don’t want the quinces to break up – just push the slices under the syrup from time to time. Carefully strain the quince – discard the peel and spices, but keep the syrup. Return the syrup to a pan and boil it to reduce by at least a half. Pour the reduced syrup over the quince slices. I promise you, this is worth the phaffing round you do in the peeling/slicing stages – not only does your kitchen smell like heaven while you are poaching them – it smells gorgeous again once you turn it into something else…. 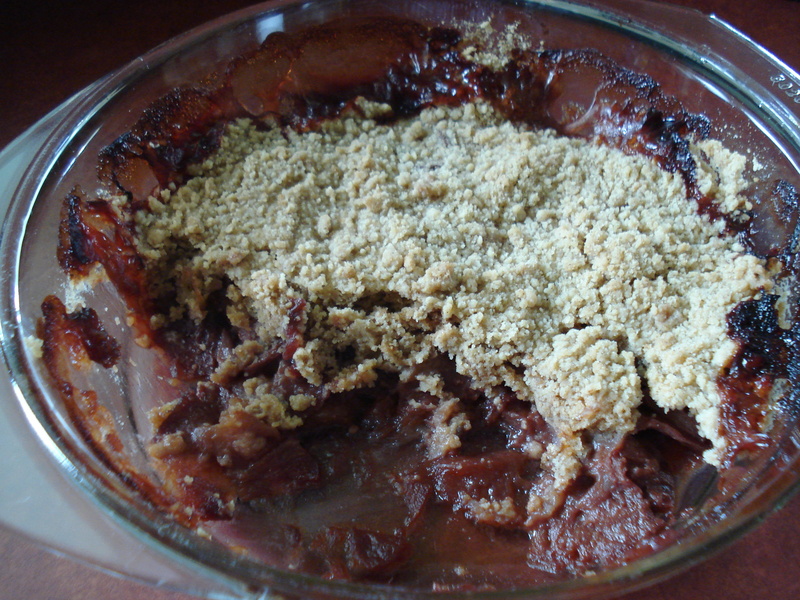 pie, crumble – it would be wonderful naked, with custard… the QUINCE naked – NOT YOU! Oh I don’t know … naked consumption of quince and custard could lead to some interesting developments. Ahem. Quinces, eh? There’s a blast of the past. I haven’t seen them since my childhood. My mum used to make fabulous quince jam. I loved the unique almost gritty texture it had. Janet – I have never had Qunice before – but this sounds wonderful. Any kind of crumble has me nailed! I think the jelly would be fabulous too, especially with roasted Lamb…yummm! on February 24, 2012 at 2:48 am | Reply "Susan Says..."
I have never even tasted quince but now I want to…and I adore crumbles of any kind. I love crumbles and pan dowdy’s; but have never even tasted a quince. Perhaps now I’ll pick one up when next I see one. My dad planted a quince tree once many years ago and yes, ripping the inside of your mouth out is a perfect description. I so love quinces, they are wonderful aren’t they! I adore quinces, but they’re so hard to get hold of these days. I’ve been lucky occasionally and scrumped some from a neighbour but I don’t think I’ll be quite so lucky again (new less friendly neighbour!) The main trouble with quince is that it needs loads of sugar (or for my palate to completely re-jig itself).